There are many opportunities to buy sparkling wines which often cost as much as the "benchmark" wines from France's Champagne region. Italy, which used to import significant quantities of Champagne, has many producers of top sparkling wines. Other "new world" wine regions are also exploring the possibilities of making good bubblies. Since we routinely drink French Champagnes and have good familiarity with the major producers of sparkling wine here in California, we thought it might be interesting to survey some wines from a few other areas. We assembled a modest set of eight wines. One wine emerged as the winner, but by a rather slim margin. First through sixth place were separated by a mere 7 points, so one taster's rankings could turn this tasting upside down! Notes compiled by Gerald Weisl, with Bob Gorman adding his two-cents' worth. One taster found "Nice autolysis here with good depth and complexity." Another encountered a "big, rich sparkling wine with a toasted hazelnut quality...good structure, too." But others reacted negatively, finding odd, unpleasant aromas. One person said it had a "manure-like character on the nose, but the wine was nice on the palate." Another felt the wine had an oxidized character. Bob also found fault with this, noting it has "White chocolate, almonds (curious! ); relatively dark, ripe, old smelling; borderline oxidized. Oxidizing flavors as well; O.K. stuff reminds of a 2nd rate Spanish Cava." Gerald found intensely toasty notes on the nose, for the most part, but on one pass through, there was a 'swampy' element showing, so I can understand how some people did not care for this wine. I found smoky notes on the nose and lots of yeasty components. The wine, for me, has a chalky sort of minerality which I likened to some Champagnes. The appley fruit is correct and the wine is rather dry. I gave it a two star rating on my three star scale, no stars being a wine of standard or ordinary quality. 7th Place: BRUNO GIACOSA 1997 "Extra Brut"
"This wine displays a lemony, rich yeasty aroma," said one panel member, adding "It's got a tart acidity and rich, ripe baked apple fruit notes." Another person found it to be "a little skunky on the nose and slightly bitter with green apple tanginess. It is big and complex, though." Someone else found it redolent of "cardboard and it's very short on the palate." But a fourth person found "Toasty notes with nice autolysis. It's very Champagne-like and crisp, complex and dare I say, refreshing on the palate?" Bob was not an enthusiast for this wine, finding "Citrus rind, marzipan (curious! ); loose, shrill; and perhaps a trace of volatile acidity. Apple drops on the palate with a bitter finish." Gerald liked the mildly yeasty notes on the nose. It's not a grand expression of artistry, but the wine is correct and clean, with a hint of appley fruit and yeastiness on the palate. One star. 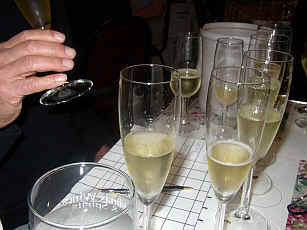 6th Place: ANTINORI "Cuve Royale Extra Brut"
One person found this to be "light, bright and uninteresting." Another, more enthusiastic taster, described it as "big, rich, elegant, toasty and an easy first place wine!" Someone else was bothered by the "metallic notes on both the nose and palate." Bob found "Classic yeast/toast, wonderfully smoky notes! Very fresh smelling. Toast & butter on the palate; the wine has a nice "chew" and very long; splendid mouthful!" Gerald found the nose to be reasonably nice, with some bread-like, yeasty qualities, but was bothered by the candied quality of the fruit on the palate. It is a standard quality bubbly, to me, with no special attributes. 5th Place: HUIA 1998 Marlborough "Brut"
"I found slightly bready, baked apple and quince notes on the nose along with a baked grain sort of character." said one taster. Another found this to be "heavier and not as lively as others. It's okay, but a bit flat." Someone else described this as a "drier style of bubbly, rather aperitif-like. Very nice!" A fourth critic "didn't find much here...it's light and pretty." Bob found some positives in this New Zealand wine, describing it as "Stony, smoky edge, smells of classic Methode Champenoise; it has some elegance and a touch of nut brittle comes up. Nose translates to the palate, the nut/butterscotch thing especially; nice but a bit flat." Gerald encountered an "almost woodsy, smoky note" on the nose with some pleasantly yeasty fragrances. The wine shows the same features on the palate and it's toasty and crisp. The balance is rather fine and the wine has a nice, long, lingering finish. One-and-a-half stars. 4th Place: GREG NORMAN ESTATES "Sparkling Chardonnay Pinot Noir"
One critic found "toasty, creamy lean-styled bubbly here with a slightly astringent and bitter finish. Some green apple notes, here, too." A second person detected a "ginger note which made this more French-styled for me." A third person found "Yeasty, big, toasty notes, but it's not crisp but 'mushy.'" A fourth person did not care much for a "Metallic flavor and aroma" nor what they felt was "low acidity." Bob was lukewarm to this Aussie entry, finding "Toast, yeast notes border on oxidized; malic (apples); fruit has a "tired" smell. 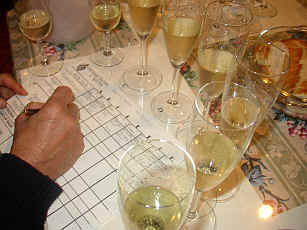 On the palate the apply, malic notes are tempered by some hazelnut; a decent bubbly but short, and low in acid." Gerald described this as having a note of coconut on the nose, with mildly yeasty notes. There's also an odd note of dried mushrooms, too. The flavors are a bit soft and round, with some citrus and apple fruit. Pleasant, but not grand. One star, perhaps. 3rd Place: BELLAVISTA 1997 Franciacorta "Gran Cuve ~ Pas Oper"
One panel member felt this was "the most bubbly wine of the group. It's tight and has forward fruit with a crisp finish and a complex, long aftertaste." But someone else's perspective was different as they described this as "dry and not showing much fruit and it's rather clumsy." A third critic found an off note to the nose, saying this has an "aroma 'stink.' It's woodsy and bitter on the finish and rather high in acidity." Someone else found this to be "aggressive as though some skin components from the grapes are displayed here. The wine is simply coarse." 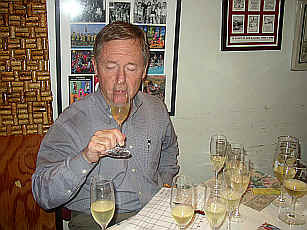 Bob said the "Beer-like yeast note gives way to deep fruit from Pinot and then ripe Chardonnay with hints of chamomile. A delight! 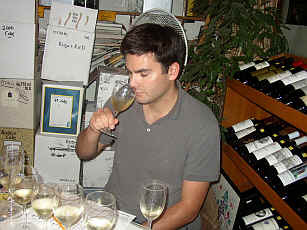 On the palate the wine is balanced, clean, with abundant fruit and delicious flavors, nicely concentrated if a bit hot." Gerald enjoyed the smoky, toasty aromas of the yeast and appley fruit. The wine, he felt, has a nice texture on the palate, being rich, toasty and having some 'grip' (perhaps what one person described as 'coarse'). The finish is long and creamy...very good! One-and-a-half to two stars. 2nd Place: ARGYLE 1998 Oregon "Brut"
"This is a bright, somewhat grassy wine. It doesn't feature much sparkling wine autolysis and is simple." Another critic found it "Sweet compared to the rest of the field. It's got a caramelized note, too. Light fragrances." A third critic found it "way too sweet for me. It's very fruity and simple." None of its fans voiced an opinion. Bob encountered "Scents of pine forest (lees? ), nice yeasty notes; full, if simple but not a classic example of "Methode Champenoise" Is there some other grape variety involved? The wine is very apply especially on the finish (think hard cider) and finishes flat." Gerald found it lightly fruity with a touch of citrusy notes and a faintly yeasty quality on the nose. It's off-dry on the palate with zesty, bright fruit, some green acidity and a bit of sweetness to keep it balanced and moderately interesting. One star. 1st Place: YERING STATION 1996 "Yarrabank"
One critic found this to have "the richest nose of all. But it's not all that large or interesting." Someone else found "baked peach aromas in this tart, crisp, lemon-lime-like bubbly. It really needs food to balance it." A third taster questioned whether or not there's some oak on the nose. A fourth found "Appley scents with a touch of oak. It's warm and heavy on the palate as well as being coarse and simple." 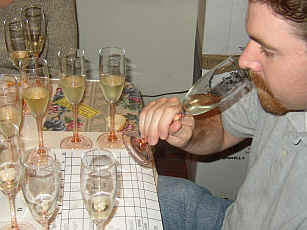 Bob found "Smoke, toast, classic Methode Champenoise; Chardonnay seems to dominate; ripe, nice yeasty note. Nicely dry, simple but very tasty." Gerald's glass didn't seem all that bubbly. The wine displays a citric note and a lactic fragrance. The flavors are pleasant and the wine dry and mildly acidic, but it needs more 'life' to it. One star.